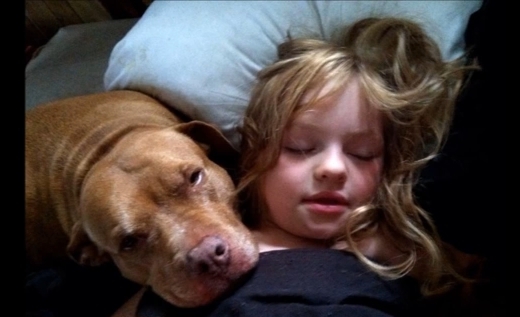 Karma is a 9-year-old Pit Bull who looks after her 6-year-old human Lacy. Lacy has severe Autism and is non-verbal. Adopted as a puppy, Karma always has looked after Lacy and has an instinct for understanding what Lacy needs. Karma and Lacy's mom, Amanda, says Karma "is a blessing to my child and continues to be a blessing to our family." "Dog has never had any type of "Therapy Dog" training yet she instinctively is understanding of Lacys needs"
NOTE: While everyone with an autism spectrum disorder has a difficult time with social skills and communication, people with severe autism are most likely to be entirely unable to use spoken language. They may also appear to take no notice of the people around them. It's important to know, however, that appearances can be deceiving: some people with severe autism have learned to communicate using sign, spelling boards or other tools. Some of those people are quite articulate, and they make it clear that at least some people with severe autism are more aware than they appear to be. Responses to "Autistic Child And Pitbull: Inseparable Best Friends (VIDEO)"